This event aims to answer that question and support local health systems in planning how they will deliver the outcomes set out in the long-term plan and prepare for the national implementation programme in the Autumn. To further support this agenda Vision is also creating a practical guide to designing population health programmes at primary and primary care network level called Population Health Management: Planning Not to Fail. Sign up to receive an email alert when the report is ready to download. We will be using the conference to gather information to support the publication, and we will be publishing shortly after the event with conference delegates getting the first site of a report we hope will help shape the way the NHS designs primary care population health programmes in the future. The report will draw heavily on the work of Trish Greenhalgh, a leading Oxford academic and will have a foreword by Professor Sir Muir Gray one of the country’s leading proponents of population health and the father of UK’s health screening programme. Vision thinks in the light of the renewed focus on improving services outside hospitals and moves towards more joined-up, preventative, proactive and personalised care for patients, this conference will provide valuable insights into how NHS organisations can work with local authorities, the voluntary and community sector, housing and other partners to deliver improvements in the health of local populations. 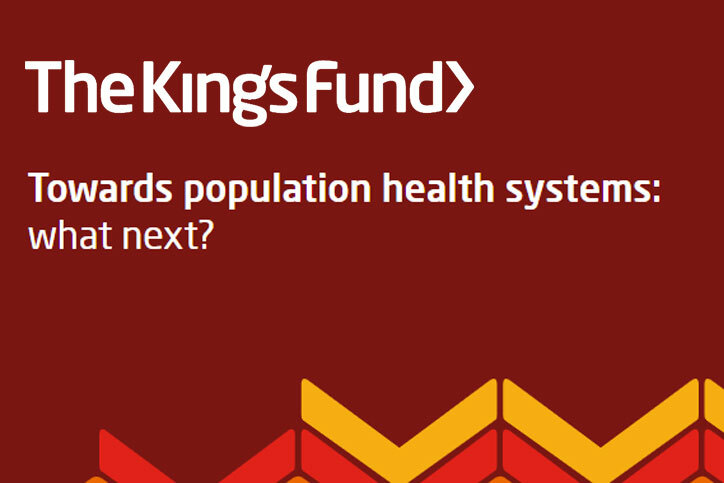 We are also keen to see how it builds on the King’s Fund report, A vision for population health: towards a healthier future. By the end of the event we hope delegates will have been provided practical guidance on how they can develop plans for shared population health systems and turn a vision for population health into a reality. Although Vision is keen to emphasise the role its cross-platform Outcomes Manager system can play in joining up data in primary care networks our primary aim in supporting this conference is to build awareness about the steps necessary to design robust population health management approaches based on patient needs and designed to deliver outcomes. The event will look at national action, including the Department of Health and Social Care’s Green Paper on prevention, as well as local examples of how to connect the four pillars of population health: the wider determinants, our behaviours and lifestyles, an integrated health and care system and the places and communities in which we live. Speakers include Sarah Price, Executive Lead for Population Health and Commissioning, Greater Manchester Health and Social Care Partnership Learn who will be sharing her experience of how to implement PHM based on neighbourhoods, served by an integrated team based in the community. Sarah will also be demonstrating PHM can be linked to the wider determinants of health through links with Greater Manchester Combined Authority’s plans for transport, housing, economic growth, planning and integrated health. Other speakers with a wealth of local experience include Dr Phil Richardson, Chief Integration Officer, NHS Dorset Clinical Commissioning Group and Lead Director, Dorset Integrated Care System and Sam Burrows, Deputy Chief Officer and Director of Strategy, NHS Berkshire West Clinical Commissioning Group and Programme Director, Berkshire West Integrated Care System. It would be great to see all our friends there and we hope you can join us. Not at the event? Sign up to receive an email alert when the Vision PHM report is ready to download.